Roxio Easy DVD Copy allows you to copy and convert various video formats to DVD. You can, for example, take AVI files and make a DVD out of them. You can also convert DVDs to iPod format, and even make DivX discs (or to make DVDs out of DivX discs). This guide will provide instructions on making DVD to DVD copies, either 1:1 copies or converting a DVD-9 to DVD-5 by removing content or shrinking. This guide is aimed at beginners, so you don't need to know too much about DVD copying before you begin. Installation is easy. Just run the installer and after a system restart, Roxio Easy DVD Copy is ready to use. The actual Easy DVD Copy interface is actually just a front-end to access the Video Copy & Convert tool, which is the tool that does all the work. So you can actually just access this tool directly and skip the Easy DVD Copy interface altogether. While this step is not strictly required, it would be better to work off files from your hard-drive as compared to the disc, because processing could take an hour and so and the continuous disc drive access could overheat your drive (whereas hard-disks are much more used to this kind of sustained processing). Easy DVD Copy only supports un-protected DVDs, so if the DVD you are trying to copy is copy protected, then you will have to find some other means to get it to your hard-drive. Instructions on ripping copy protected DVDs cannot be provided on this website due to legal reasons, and the act is most likely illegal in your country even if you use it for personal/backup reasons. In any case, copy the DVD to your hard-drive. You should now have a bunch of DVD files on your hard-drive - the folder containing these files is called the "DVD-Video folder". Start the Video Copy & Convert tool. Since most DVDs are DVD-9 (usually around 8 GBs) and single layer blanks have just over 4 GBs, Video Copy & Convert can compress the original DVD to make it fit, which will affect picture quality. Otherwise, you can also choose to remove content and then compress what is left (if needed), which will improve quality (for example, you can remove all the extras and only keep the main movie). Decide what you need to do and choose to follow "Step 2a: Copying the Entire Disc" (copy everything, compress everything to fit) or "Step 2b: Copying Parts of the Disc" (copy only selected parts, compress these parts to fit if needed). Using "Step 2b" has the added advantage of allowing to you add your own video files to the DVD. Use this step if you wish to copy everything on a disc (with the option to remove some additional languages/subtitles). If you prefer to copy only selected parts of the disc, then skip to "Step 2b: Copying Parts of the Disc". In Video Copy & Convert, click on the "DVD Video Copy" button at the top to get to the following screen. Under the "Source" section, use the drop down menu to select the "Browse for Disc Image/DVD-Video folder" option. The "Media Selector" should pop up. Navigate yourself to the folder where your DVD files are stored, and the video contents of this folder will be shown on the right hand side (in the screenshot below, the title with the longest running time is referred to as "Movie 1", as this is usually the main movie. The other video titles are referred to as "Extras"). Press the "OK" button to load the DVD-Video folder into Video Copy & Convert. On the bottom of the main Video Copy & Convert screen, you should see a size bar and an option to select the media type. This option allows you to set what kind of media you are going to make the copy on. The options are single layer DVD+/- blanks, dual layer blanks or DVD-RAM. The "Content Quality" rating shows what the estimated finally quality will be like for the current copy. Since most DVDs are DVD-9 (usually around 8 GBs) and single layer blanks have just over 4 GBs, Video Copy & Convert will actually compress the original DVD to make it fit, which will affect picture quality. The more compression, the lower the quality. To truly make a 1:1 copy, you will need to use dual-layer blanks. But even a compressed disc will still look acceptable on all but the largest screens. The content quality could range from "Good" to "Excellent" or even "Identical to Original". The size bar (orange in the first screenshot below, green in the second screenshot) shows how much space will be left on the output disc (the first screenshot below shows no space is left and that all 4428 MB on the disc will be occupied, the second screenshot shows a little bit of space left on the 8147 MB blank). If "Content Quality" is "Excellent" or "Identical to Original", then the size bar will turn green. Keep an eye on the "Content Quality" and size bar status throughout to make sure you're not cramming too much onto the disc. After you load in the source DVD-video folder, the "Source" section should now show a preview of the video (usually the menu). 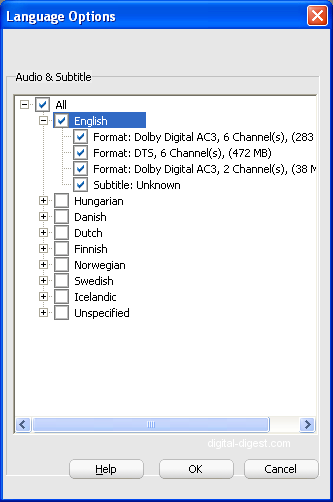 Now sometimes a DVD might contain multiple language tracks, and you might not need to copy all of them. Certainly, if you are not using dual layer blanks, then you should try and only keep what you need to improve picture quality. If you are using dual layer media, then there's not much point in removing the additional tracks. To remove unwanted language tracks, click on the "Language Options" button. In the new window that opens, you can select which audio and subtitles tracks you want to keep (the "checked" ones), and which you want to remove (in the screenshot below, I've only kept the English audio and subtitles). Sometimes a DVD might even have multiple audio tracks in the same language (eg. DTS and Dolby tracks), so you might only want to keep one of them (but be careful, some 2 channel tracks contain the audio commentary, so you might want to keep that). Press "OK" when you have finished your language selections to close the "Language Options" window. Once you've removed some languages, you might notice that the "Content Quality", size bar status might have changed to reflect this (in the example I'm using for this guide, the "Content Quality" changed from "Good" to "Excellent", and the size bar status turned green after I removed everything except the English language). Now we will select a destination. You can burn the output straight to a blank disc, or you can create a disc image or another DVD-Video folder on your hard-drive. The advantage of burning to another DVD-Video folder is that you can test the DVD on your computer first, using PowerDVD or WinDVD (both supports loading DVDs from the hard-disk). If you choose to burn straight to disc, then under the "Destination" section, use the drop down menu to select your DVD writer drive and then insert your blank media. You can select the burn speed (try to use 4x, as that will guarantee the best compatibility, even if your media is rated for higher speeds) and also the number of copies you wish to burn. There are also some advanced burning options available if you click on the arrow button beside the "Copy Now" button and select the "Advanced Copy" option. A new window will pop up with more burning options that you probably won't need to change anyway. Click on the "Copy Now" button or go through the Advanced Copy options to start the burning process, and then you should have your copy in a while (the length depends on how much compression needs to be done). This guide is now finished for you, so you don't need to continue reading. If you do want to burn to your hard-disk first, then from the "Destination" drop down menu, select "DVD-Video Folder". Press the "Save As" button just above it and select a folder to save your files (to avoid confusion, create a new folder to save your files in and do not save it into the same directory as your source files - although Roxio will create a new folder for you as to not overwrite your source files, it can still be confusing). Once you have the Video Copy & Convert produced files, you can then use PowerDVD or WinDVD to load the folder containing these files and play the movie back. If everything works as it should, then you can burn the folder as a DVD-Video disc. There are many ways to do this, both free (ImgBurn: guide) and commercial solutions, but there's nothing to stop you from using Roxio Video Copy & Convert to burn the processed files again (this time, Roxio won't re-process the files as they have already been processed to fit onto your blank media). To do this, basically repeat the steps above and load the processed DVD-Video Folder into Video Copy & Convert, but this time, do not set a language option and burn straight to disc using the instructions above. This guide is now finished for you, so you don't need to continue reading.